I was so excited when my friend Bernie asked me to create a Blogger Bundle from her shop. As a quilt blogger there's been a tiny voice in the back of my head whenever I've seen other blogger bundles that it would be so much fun to put one together. I set out to shop for my fabrics in Bernie's lovely fabric shop, Needle & Foot, Fine Fabrics. There are a lot of great prints to choose from like these adorable frogs and this fun rainbow confetti. And my daughter would love these sassy cats. In the end I decided on a more versatile palette and stuck true to my fabric preferences with a bundle of blenders! I changed up one of my favorite palettes to include a beautiful, sunny yellow. I love the geometric lines of the navy combined with the circular patterns on the other fabrics. Left to right, they are Dots in Grey, Sashiko Florette in Teal, Terra Firma in Sunlit, Bubble Dot in Teal/Aqua, and Atomic Web in Blue. I paired the bundle with Kona Pewter and designed this block. This is the first of four 16" blocks to turn my bundle into a baby quilt. Stay tuned for more! Posted in Fabric, Quilting. 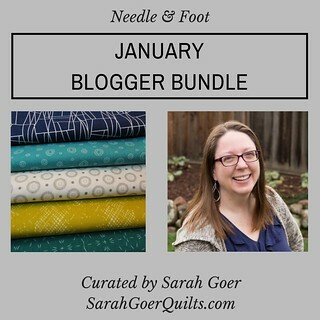 Tags: blogger bundle, fabric, fabric pull, Needle & Foot on January 10, 2018 by sarah. I'm so glad I found your blog through Bernie's! Beautiful combination of colors! I just subscribed to your newsletter and will follow you on Instagram as well! Thanks for the giveaway! What fun it must have been to put together a bundle. Love your choices. Thanks for the opportunity to win this! That pop of yellow looks great with the teal and navy! 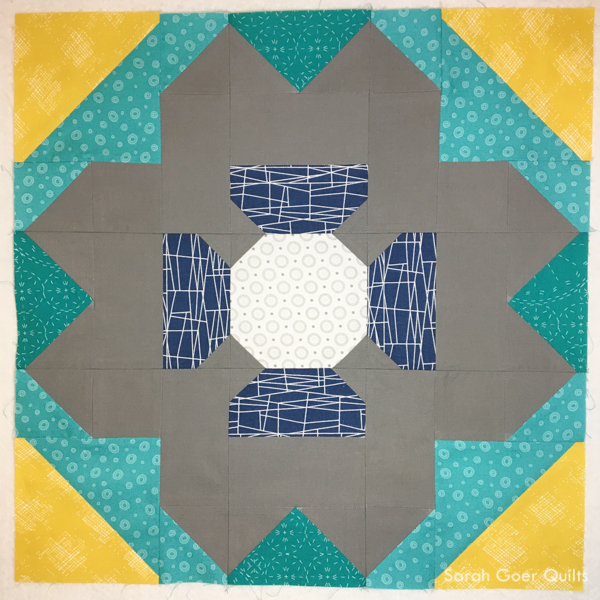 Lovely block and bundle, Sarah! I love the sunny yellow next to those teal fabrics! Very bright! I love every fabric I’m that bundle. It’s beautiful! I like the block you've made. The use of the gray is a great idea! I'm especially drawn to that yellow/gold fabric though! Thanks for sharing your bundle. Just discovered you thru the link on IG. I’ll be following now. Thanks for the giveaway. Love this bundle! Look forward to seeing the finished baby quilt! I love yellow and teal! Very nice grouping. Thanks for the giveaway. I like the bundle but it definitely needed that dark grey. Love the colour combo in your bundle. Just beautiful. I love the colors you pulled together in this bundle! What a stunning combination. Your color eye is spot on. I really like your bundle of fabrics! Teal, navy blue, and that touch of yellow to set it off. Have fun making your baby quilt! I just subscribed to your newsletter. Looking forward to it! Thanks. What fun colors and textures! Thank you for sharing. I just signed up for your newsletters. Looking forward to reading it. I love the colors in your bundle! I signed up for your newsletter, I'm looking forward to getting to know you! Beautiful colors! I like this color combination, even though I would not have chosen it. What a pretty bundle! I love the navy! I am a new subscriber also! The teals are beautiful and I love the addition of the yellow. I really love the lime green with my favorite color: turquoise. Nice combination. This is a super attractive bundle! Thanks for the chance at a giveaway. What a pretty collection of prints and colours. And they look awesome with Pewter. Can't wait to see your blocks sewn together. Love your color choice bundle and pairing with the pewter is perfect. Is the block a flower? I don't think I have seen that block design before. I also just subscribed to your newsletter-can't wait to get to "know" you! Love your Bundle! Perfect match of colors!! Would make a perfect gift for our Grangirl! Your have matched their home colors like you have been talking with her! giggle..
Bernie's blog has led me here, and it's so great to see your curated bundle! I've signed up to follow via email, but must check spam folder for confirmation email. Looking forward to getting to know you! And, ta da! The email had gone to spam, I corrected that misplacement!, and have confirmed my sign-up - yay! Hi! I found your blog via Bernie’s blog at Needle and Foot. I’ve just subscribed to your newsletter as your colours and style appeal to me. Looking forward to a long and happy ‘blogship’! These fabrics are definitely my favorite color combo. Thanks for a chance at a great giveaway! Your news letter is going to come to my inbox. Love the color combo. 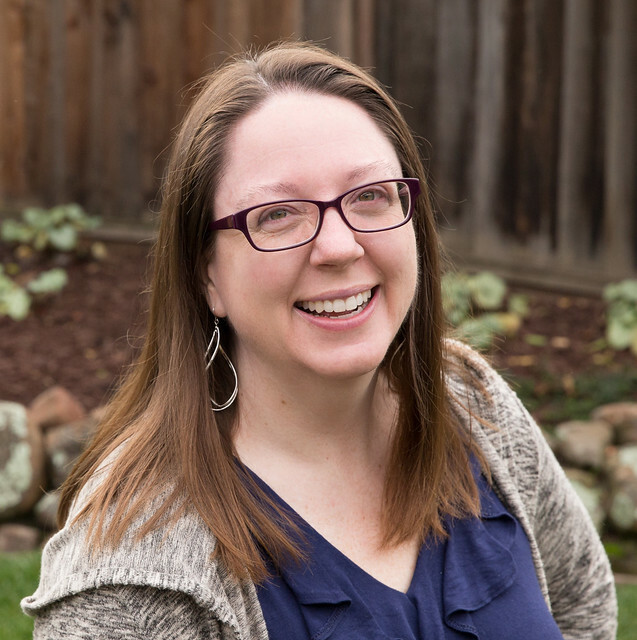 I’m a new subscriber to your blog! Lovely bundle. I would like to see this over an entire project. This bundle of fabric is so pretty! There are a lot of possibilities and inspiration in it. Thanks! I am a new subscriber to your newsletter and a new follower on Bloglovin. Thanks! You know I can't resist a good blender bundle! Your bundle is absolutely fabulous, Sarah! That Yellow! I am swooning. My favorite!!!! This is a great curated bundle. The colors work well together. I subscribe to your newsletter. I'm looking forward to seeing the other blocks in your baby quilt. 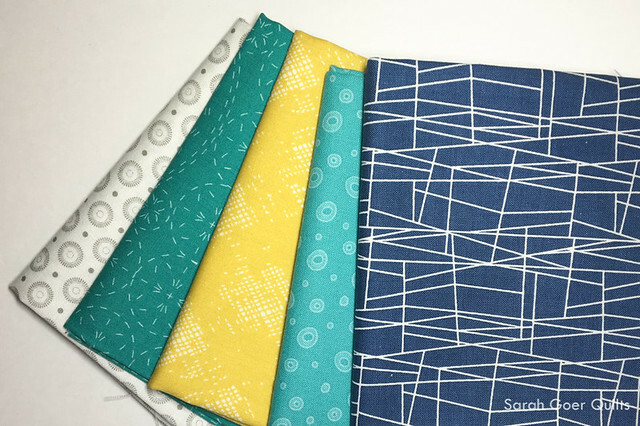 Love this bundle, especially the sashiko print. Thanks for the opportunity to win. I read about your temperature quilt along and found my way here! Hi Suzette! Welcome. I'm glad you're here, but just to clarify it's Chris who is hosting the Temperature Quilt 2018 QAL. You can see all the details on her blog, Colorful Om. The turquoise fabrics are my favorite for sure. I am a subscriber to your newsletter by email. This is such a great bundle, and it pairs beautifully with Kona Pewter. 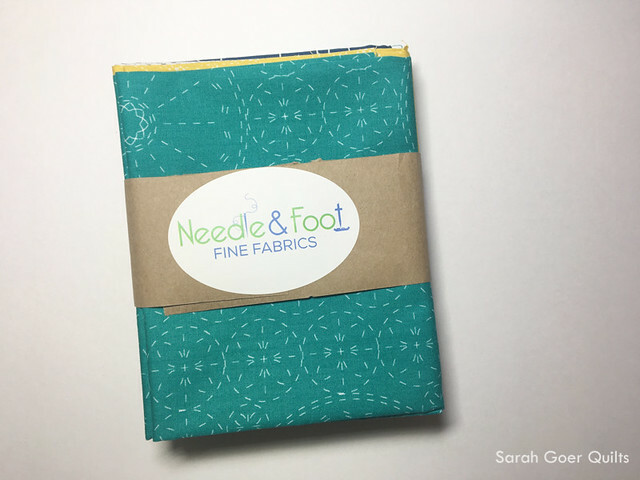 That teal fabric definitely needs to be in my stash!!! I am one of your original newsletter subscribers, and I also look forward to the imaginative palettes you share. There are several I’d like to try some day. Love your choices for the bundle! The colors are favorites of mine and the prints would work with so many things. Just gorgeous. Eye catching fabric bundle! To Drool for! What's great bundle! These colors would be perfect for a table runner for my dining room. I get your newsletter via e-mail. I have been using a little yellow in quilts, it gives the quilt a little pop. Love your blocks. That is one of my favorite palettes as well, and I love the addition of the yellow! Excited to begin receiving your newsletter. I am a subscriber for your newsletter. Thanks. Great site and giveaway!! Thanks for sharing. I'm a subscriber as well ! I love your bundle! The colors together are wonderful! I'm particularly drawn to the navy. I'm a subscriber to your newsletter! I’d love to win the bundle. I just “discovered” you, Sarah, on Instagram and am enjoying your designs. I really love your bundle! Adding the yellow to the mix is perfect...it's winter...we all need a ray of sunshine about now! The blocks you made is great. I like the navy blue with the other contrasting colors. This is my second comment. I didn’t know you wanted separate ones if you are new to this blog. I can see those fabrics in a Chinese Coin quilt. I get your newsletter!! Thank you!! I love the color combination. I wouldn't have thought to use the grey. Woo Hoo, thanks for the chance to win! This is my 2nd comment, I subscribe! I enjoy your newsletter for several reasons: love the content, your sharings of thoughts on how you go about quilting (1/8' vs 1/4' matchstick on your most recent mini for example) are fun and motivational, but mostly your energy and enthusiasm keep me very engaged. Thanks for sharing! Wow! What wonderful designs that you came up with, eye catching!! Fabrics are fantastic, love the colors. That will be one lucky baby!! very nice choices in your bundle - I really am drawn to that teal bubble dot - sew nice!!! Very cool bundle. I like your color choices! Have a fun day! What great fabrics!!! I want to make quilts for my twin grandbabies!!! I subscribe to your newsletter!!!! It's is a beautiful choice of fabrics. I love the addition of the gray on white and they yellow print. But that navy with lines is fantastic! Thanks for the opportunity. I am a newsletter subscriber but have only been receiving newsletters for the last 6 weeks or so. Thanks. The yellow brings the collection to life. Receive newsletter. I am a newsletter subscriber. Thanks for the chance to win some awesome FQ's. I love the block and would like to make a quilt featuring it. Sure glad that I found you. I am a new follower and am excited to be one. Gorgeous color scheme - so much potential! I love these gender-neutral colors and patterns. The yellow is a wonderful spark!